Dress found? Check. Reception booked? Check. Cake chosen? Um, why do we have a cake again? 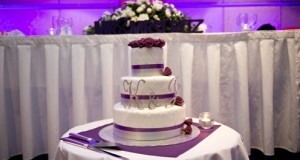 The wedding cake has become so synonymous with the wedding plans, that many don’t question its inclusion. But have you ever stopped to consider its significance? 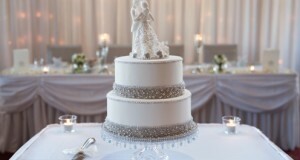 Do you know where the tradition of the wedding cake came from, or who came up with that beautiful tiered design? Learning a little bit about the cake will help you appreciate your special day even more. The concept dates back all the way to the time of the Roman Empire, when Romans baked barley bread with wheat and salt. During a wedding ceremony, the groom would eat some and break the rest over the bride’s head. This was a symbol of prosperity and fertility and also guaranteed children from the marriage would qualify for high office in Roman culture. Guests all wanted a piece of the action too, and attempted to catch the crumbs, hoping the good luck would rub off on them. In medieval Europe, it became a tradition for guests to bring small cakes to a wedding, which would be piled up as high as possible. If the bride and groom could kiss over the top of the intact tower, they were said to be in for a lifetime of prosperity. However, in the 1660s, a French chef visiting London saw this stacked debacle, and decided he could do better, conceiving an iced, multi-tiered cake. Originally reserved for Royalty, tiered cakes had to wait for the invention of hardened icing before the upper layers could be made from real cake, not just spun sugar. Bride’s pie became another popular dish at less affluent weddings around the 17th century. Filled with sweet breads, sweet mince or meat, the pie contained a glass ring, the finder of which was said to be the next to marry. Around the 19th century though, Bride’s pies were replaced by popular sweet plum cakes. From the mid 19th century, it became popular for couples to preserve the top tier from their cake for the christening of their first baby. Although now, it’s more likely to be saved for the first wedding anniversary, or given out to guests. Without refrigeration, early cakes were frosted in lard (yuk), which was removed just prior to serving. Later, the lard was sweetened and left on the cake (even more yuk). While icing techniques advanced, ingredients were difficult to come by, so the whiter the cake, the more affluent the family appeared. Not so sweet In the early 16th century, Henry VII limited the amount of sugar common folk could use in a wedding cake to restore funds drained during the reign of King Edwards. Restrictions imposed after WWII meant wedding cakes reduced in size for a couple of decades. A bride who cuts her cake will work hard her entire life. A couple that cut their cake together will share all their possessions for life. Sleeping with a piece of cake under your pillow can send you dreams of your future spouse. 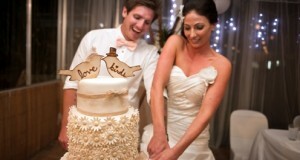 Feeding each other cake symbolises the bride and groom’s mutual commitment to one another. It is said that in the early 1700s, English baker Thomas Rich was inspired by the striking bell tower of St Bride’s Church on Fleet Street in London, and created the design still used today. Norwegians and Dutch have a cake called Overflødighedshorn at their weddings, which means horn of abundance. In Appalachia, United States, due to the expense of wedding cakes, guests would bring layers of cake, which the family would then sandwich together with spiced dried apples. The number of layers in this Stack cake indicated the couple’s popularity.